Veolia North America delivers steam based district heating and cooling systems in Baltimore, MD through several steam plants within the city. The steam system services various city buildings. This includes the Baltimore Convention Center, other municipal buildings and several hotels throughout the city. 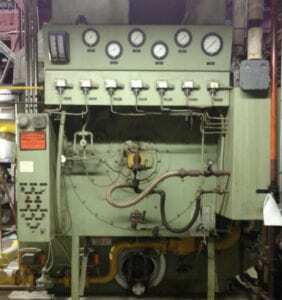 Electronic Control Corporation was hired to upgrade the existing steam boiler control system in which the original Bailey controllers were so old that replacement parts were unavailable. This presented a high risk of permanent failure of the steam boiler control system. The customer required staying with the GE steam boiler control Programmable Logic Controller and HMID components. So ECC-Automation rewired the electronic control system into a GE Series 90-30 PLC, along with a GE touch screen. They also provided analog and digital input/output modules for the existing GE rack. Additional I/O capacity for the upgraded control panel was required as well. The installation team bypassed the old Bailey controllers, then integrated the brand-new modules into the 90-30 PLC. A pressure transmitter and I/P signals were also wired in to the new GE electronic control module. GE maintains a notable presence in boiler manufacturing and management and comprises around 30% of all boilers worldwide; this includes boilers for steam power, heating and cooling. 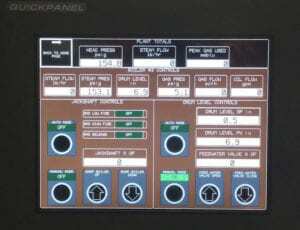 To ensure all implementation and programming protocols for the GE steam boiler control system were met, the ECC-Automation installer/programmer got trained on GE control systems and their Prophecy software for this project – in order to precisely program the HMI and the PLC. Sending a 4 to 20 mA analog output signal out of the PLC over to the I/P: based on the systems parameters, you have to scale inside the PLC from 0% to 100% open / from 4-20 mA. The current would open on the one side of the I/P, opening a valve to move the boiler’s jack shaft that controls the amount of air and gas in the boiler, and in turn generates steam coming out the boiler. From turning the boilers on and monitoring every process during boiler control, the burner management system a critical safety component. It ensures the steam boiler is operating properly and removes the risk of hazardous outcomes during start-up and operation. It is a separate electronic control panel that allows inputs and outputs to and from the boiler, to ensure it is functioning in a safe and accurate manner. An electronic control field technician cannot and must not work directly on this component, unless certified according to ANSI NFPA 85 / ISA77 Standards ( ES16 ). Typically, these electronic controls come with the boiler from the manufacturer. ECC-Automation only had to program digital inputs and outputs from the GE HMID to notify the Burner Management Controller that it was time to start up the steam boiler. If anything regarding this component would have been required, the team would have called in specialist, certified in burner management control, to handle the work. When the boiler is first turned on, a signal goes immediately to the burner management controller. The burner management system or BMS then takes over. The boiler opens the gas valve and ignites the gas. During this process of ignition the jack shaft is opened 100% allowing air to purge any residual gas from prior operation. This purging prevents a potential explosion of the system and resulting damage to the facility. Once the boiler fires up and starts to produce steam, the BMS then releases to modulate – so at that point in time, the main electronic control system has full control of the boiler. The steam boiler control system was previously “automated” in that you could control each individual boiler. Saratoga street had a total of 5 boilers and there was a separate steam boiler control panel for each one. Electronic Control Corp. technicians bypassed the bailey controllers and brought all the analog & digital signals into the GE Series 90-30 PLC. They then programmed it to control all 5 boilers; still capable of being controlled separately, but from one Boiler Control System. A pressure sensor in the main steam supply connects to a pressure output signal coming from the large main steam out manifold. This manifold connects up to all the steam boilers at the plant then feeds the underground main for distribution at its other end. It is critical that pressure oscillates slowly and steadily, increasing or decreasing to accommodate what is required for the main out header pressure. Let’s say there is a scenario where one of the municipal buildings requires more steam. And, in turn, increases the demand for heat at the Saratoga plant. So one or more of the steam boilers, based on pressure readout requirements from the mainline, are regulated automatically to adjust the firing rate and maintain the constant pressure required for the main steam line. A boiler drum will shrink and expand, based on temperature of the water coming into it. Modern Boilers come with a three-element-control that senses the amount of flow of steam. The electronic controller makes calculations for steam output in lbs/hr that directly correlates to the flow of water in gal/min to produce the required amount of steam. This is an algorithm within the PLC. So as it produces steam output, the input of water must be precise as possible in the boiler. In addition to temperature control, the amount of water coming into the boiler, controlled by the feed valve must also be kept at a precise level. This is another mission critical task of the control system; to remove the risk of any hazard. The burner management controller monitors this process and will shut the boiler off if it detects an improper level of water flowing into the boiler. A plant automated and controlled from one modern electronic control system rather than for each boiler. A steam boiler control system that is now easy to upgrade in terms of firmware and software versions with the modern GE Series 90-30 PLC and HMID. Overall the customer was satisfied and still allows ECC-Automation to support the system as needed. 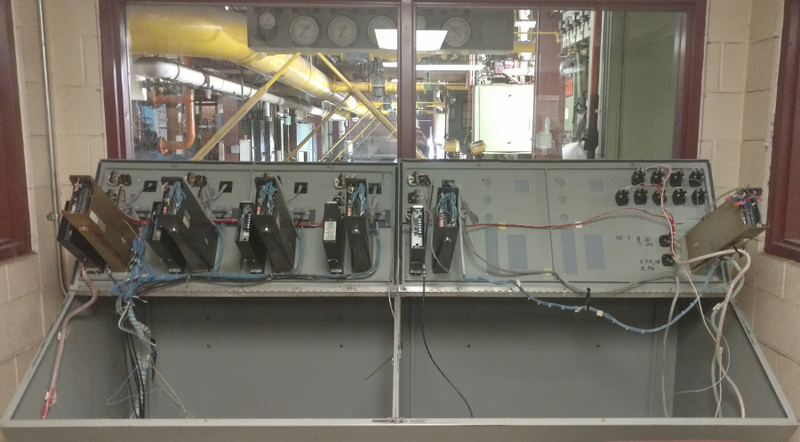 Since completion of the project, ongoing work to the municipal steam system by ECC has included replacing the electrical system in another one of the Baltimore steam plants.